Estate planning is a process for making arrangements to be used in dealing with an individual’s assets in anticipation of 2 situations: incapacity and death. Estate planning for incapacity includes creating legal documents, such as revocable living trusts and powers of attorney, that empower another person to manage the individual’s assets if and when the individual becomes incapacitated. Estate planning to address death includes preparation of documents, such as wills and trusts, that facilitate management and transfer of an individual’s assets following his or her death. What Items Should A Person Collect To Prepare For The Estate Planning Process? In preparing for the estate planning process, a person should collect information about his or her assets so that the attorney can review that information. The Law Office of James D. Fife normally helps individuals to prepare for initial estate planning meetings by providing them with blank financial statement forms, which they may use to list information about their assets. A person involved in estate planning should also compile documents that are useful in the process of preparing an estate plan. Those documents generally include previously signed wills, trusts, deeds, deed of trust (mortgages), divorce decrees, marital property settlement agreements, life insurance policies, income tax returns and other documents. There is a wide variation among individuals in regard to the types of such documents they may possess. Some individuals may have only one or two relevant documents. Others may have numerous documents that are relevant. Why Does An Attorney Need Information About An Individual’s Asset To Prepare An Estate Plan For The Individual? An attorney needs sufficient information about a client’s assets to develop and help implement an estate plan that will accomplish the client’s objectives. Relevant information about an asset includes information about the type or nature of the asset, the value of the asset, the form of ownership in which the asset is held and the beneficiary (if any) designated to receive it on the client’s death. An attorney must have information about those features of a client’s assets to be able to provide effective advice about (1) the type(s) of estate planning document(s) that should be used, (2) the types of provisions that should be included in the document(s) and (3) the changes, if any, that should be made to the forms of ownership of assets and the designations of beneficiaries of assets. How Does A Person Execute A Valid Will In Virginia? A person who makes a will is referred to as a “testator.” A will that is entirely in the handwriting of the testator is referred to as a “holographic” will. A holographic will signed by the testator does not require witnesses to be a valid will. For a will that is not holographic to be valid, the execution of the will must meet certain requirements. A non-holographic will must be signed or acknowledged by the testator in the presence of 2 competent witnesses who are present at the same time. In addition, the 2 witnesses must sign the will in the presence of the testator. What Are The Requirements To Probate A Will In Virginia? A will that is self-proved may be admitted to probate by the clerk of the appropriate circuit court without the testimony of witnesses at the time that the will is offered for probate. For a will to be self-proved, the testator and the witnesses to the will must sign or swear to an affidavit before a notary public. The affidavit must be in the form prescribed by law and must reflect that the will was validly executed.If a non-holographic will is not self-proved, it will be necessary to prove to the clerk of the court that the will was validly executed. In general, at least one witness to the will must state under oath that the requirements for valid execution of the will were met. The clerk of the court may determine whether to require 1 or 2 witnesses. A witness may make the statement in the form of a written deposition that can be presented to the clerk. A holographic will that was not witnessed may be admitted to probate if at least 2 witnesses provide testimony that the will was entirely in the testator’s handwriting and was signed by the testator. What Are The Consequences Of Not Executing A Will? 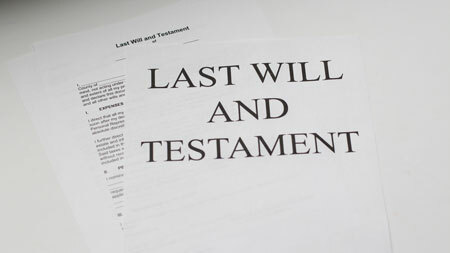 If a person does not execute a will or a trust, he or she will be unable to make decisions about how assets of his or her estate will be administered and distributed on death. A person who does not have a will or a trust will not be able to select who will receive assets of his or her estate or the amount passing to any person. Instead, those issues will be resolved under Virginia’s laws regarding the distribution of assets of a person who dies intestate (i.e., without a will). An intestate person will also not be able to select the person who will administer his or her estate (the personal representative) or the powers that the personal representative will have. Although a person writing a will may direct that a trust is to be created under the will, a person dying intestate and without a trust cannot choose to have a trust established for any beneficiary, such as a minor child. In addition, if a person has minor children, he or she will not be able to select the guardian of those children unless he or she writes a will.